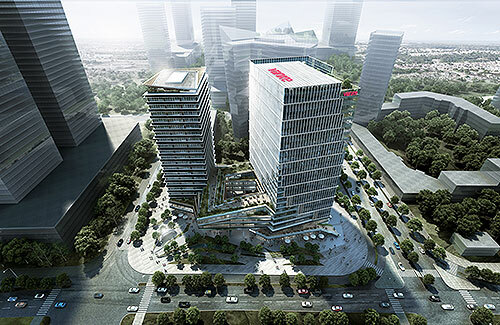 Olympic Vanke Centre is a mixed-use development located at the heart of Qianjiang Century City, CBD of Hangzhou, and host city of the Asian Games 2022. The project comprises twin towers of 23 and 21 storeys high respectively sit on top of a five-storey podium. The building is complete with three levels of underground space that serves as a car park and integrated servicing area. The towers are mainly office space, while the podium contains various foods and beverages as well as connecting amenities, such as the gymnasium, cafeteria and other entertainment spaces. Designed by LWK & Partners, the project is expected to be completed in 2021. Zooming in on the buildings, the taller tower of the project is expected to house corporate tenants, while the lower tower features numerous cubicle work stations with a generous common area intended as a breeding ground for start-ups and entrepreneurs. The podium includes two levels of F&B and other amenities, such as a gymnasium, cafeteria and entertainment space. Vehicular access to the buildings has been grouped at the rear side to enhance pedestrian safety and higher walkability to promote urban permeability. In terms of design concept, pivoted around a landscaped void at the very heart of the site, the lifted podium rotates and shears horizontally to open up cascading outdoor terraces with a spectrum of degree of publicness. The ‘unscrewing’ force turns parasitic to erode the main tower up to its crown, chipping off the massing to unveil a roof terrace dedicating to the city’s spectacles. The convergence of the two towers at the lifted podium is highlighted by the continuous deep-setting spandrel fins, which portraits sharp shadows dramatized by the changing sun angle relative to the spiralling building form. Continuity of outdoor space allows free movement of air and visual connection on plan and section; as well as encouraging human activities to spill out, expand and appropriate. The façade of the two towers employs contrasting systems of passive sun-shading to limit direct isolation, which in turn, lower interior heat gain. The external supergrid of the curtain wall enclosing the higher tower regulates the oblique glaring nuisance to neighbouring traffic and buildings, whereas the horizontally slicing timber planes of the window wall enclosing the lower tower mellowly reflect light that exudes a natural and living quality. Moreover, each tenant unit is equipped with dedicated air-conditioning systems. Individual temperature control allows tenants to optimise their indoor environment to their best comfort, and added incentive for energy saving practices to promote environmental awareness. Situated in an expansive new development area still searching for an identity, the project seeks to create an oasis to mitigate the blandness of the surroundings. The plant-lined pedestrian zone compresses to funnel the walk flow into the central courtyard. Focal emphasis is afforded to a locally sourced ginkgo tree, blotting the courtyard space with its golden leaves at season’s call. A semi-public podium roof garden serves as a bridging leisure space between the two office towers, promoting symbiosis and creating networking occasions for different building users.